It has been ages since I have seen her. Lost in the myriad problems and troubles that have crept into my life, which were once non-existent; memories of the good old days and of people who were always by my side have receded into the background. It was seven years ago when I met her for the first time in the auditorium where we were all packed together to listen to the golden words that would be spoken by the dean to invade every corner of the room and penetrate into the keen ears. None of my previous acquaintances could manage to get in to this so claimed topmost university in India. I was all alone and my eyes were searching for someone who could pacify me. Just then, someone came towards me and sat by my sad and introduced herself as Priya. One could guess by her sense of dressing, the way she spoke and the topics that she chose to speak on that she was bought up in the hands of strict, authoritarian and religious parents. The talk continued and our ears resisted the entry of those golden waves. The camaraderie between us grew quickly and she became the one with whom a secret could no longer be a secret and a problem would transform to a solution. One day, after having lunch, we were taking a walk in the lawn when the topic of love suddenly crept into our conversation. Priya’s background has forced her to attempt to divert the topic but I wouldn’t. ‘The more one tries to avoid something, the more he is likely to fall for it’, I said to which she quickie replied, ‘Love is just the beginning, the end of which is guaranteed to be a break up. Rather than attempting to find that man ourselves, it’s wise to leave the decision to our parents who are very much aware of our needs and would possibly bring to us the greatest lover in the world.’ Both of us became silent not willing to transform the discussion into a fight. The topic never again crept into our conversation but for one day when my life was ready to divert from its path and enter a new world. We both visit the library every evening to search through the voluminous amount of knowledge, read through a part of it an store a much smaller part of it in our gray cells with a hope that it would benefit us I the near future. But that day Priya was unwell and I had to go all alone. I never realised until it happened that the turn along the way leading to the library was the place that god had ordered to introduce a change in my life- one that would be welcome in the beginning but not anymore as time passes by. Lost to the tunes of the birds and the gentle touch of the wind, a student coming from the opposite side on a motor bike dashed into me and I was seriously injured. Melodious music burst out of my heart by the time images of than man reached the cells in my brain. I felt as if I have ben knowing him since ages. The looks of regret in his eyes for having injured me has taken away all the pain. I could not hear what he spoke but could only see his lips moving in a rhythmic and musical manner which I hoped, at that time, would soon say that he loves me. I felt unconscious and I never knew what happened next. On regaining my senses, I found myself lying on a hospital bed with Priya sitting beside me. I told nothing then but time made me to do so a few weeks later. It was the same road again. We were going to the library and he was coming from the opposite side. He slowed down his bike on seeing me and smiled. I too smiled. Priya noticed it but asked nothing about it. We entered the library and moved into eth vast expanse occupied with books to get lost in the world of knowledge but that wasn’t the task for that day. He came, introduced himself as Siddhartha and asked if I would marry him. This was definitely not a question which one would be prepared to answer and a question for which one would give an answer within seconds. He smiled and moved towards the exit, turning back and smiling a couple of times. That night was spent recalling those three encounters with him again and again and of the answer that he would be waiting for. I knew my decision which could be arrived at by introspecting my feelings at the first sight but fears of the love not leading to marriage delayed the decision. It was after all just fear because the marriage of my parents too started with love. The next morning, I raised the matter with Priya. As expected, she lectured me on the problems that would arise with due passage of time and how love always ends on a sad note. But I wouldn’t listen. Finally, she promised that she would take care of any complications that would arise. Four years have passed with the mornings in the cafeteria and the evenings in the library. Priya still accompanied me everywhere I went but the newly born love has moved into the boundaries of our friendship. Love dilates when divided between more than one. But still, everything was fine. Tension reached the peaks when I was made aware that my parents were in the process of hunting a bridegroom for me. Fears of the fate that my love would succumb to if a perfect bridegroom emerges out of the network of matrimonial made me spend sleepless nights again. Hoping to end the suspense of my future, I asked Priya to talk with my parents. The answer was a straight ‘no’ from them. I was surprised to hear that response from a couple who married after having loved each other. The reason they cited was the way they lost the support of their relatives and the community altogether, the differences that arose between them as time passed by and the daily fights. They wished that atleast their only daughter doesn’t face any problems in her married life. But I knew that my love was a pure as the rain drops that travel all the way down to the earth from the heavenly adobe. Official documents and signatures had led the love the marriage. The relation with my parents became almost non-existent. But in the company of my loving Siddhartha, I was probably the happiest person in the world. But the gods grew jealous of us and things changed. Serious fights for trivial things led to days of hatred between us. Life was not as lovable as it was. And there was none with whom I could share my problem except Priya. But loading her with problems that probably did not have a solution did not seem acceptable. Priya’s marriage was fixed with a rich businessman who has been picked from thousands of prospective candidates. Even before marriage, they seemed to start loving each other. The marriage would indeed become a turning point in her life but in a way quit contrary to what happened in my case. The day at the marriage was quite embarrassing. People starred at me as though I was a culprit. Ignoring their looks, i went forward to bless the couple. After that, I never heard of here again. This morning, in a bid to end all troubles, I decided to divorce. I went to the temple along with my husband for the last time and for reasons unknown. And it was there I met Priya. Priya, her husband and the love between them was the same except for a newly added kid. The happiness in their faces and the smile of their eyes forced me to thing again about the decision that I have taken. I too wanted a family like theirs filled with love and nothing less. Wouldn’t a compromise from my end in those silly fights work out? After almost a week spent without words, I spoke to him. ‘What happened on that day went we met for the first time in a strange way? Did you experience the same feelings as me?’ Conforming the query with a repetition from me, the talk continued into late night. The love that once existed between them hasn’t diminished even today. I am proved wrong on what I asserted that day - ‘Arranged marriages are better than love marriages.’ Propelled by the wish to have that same love in my life, I ended the seven days of silence with my husband and the lovable talk that resulted continued into late night. A little compromise is all that is needed…….. 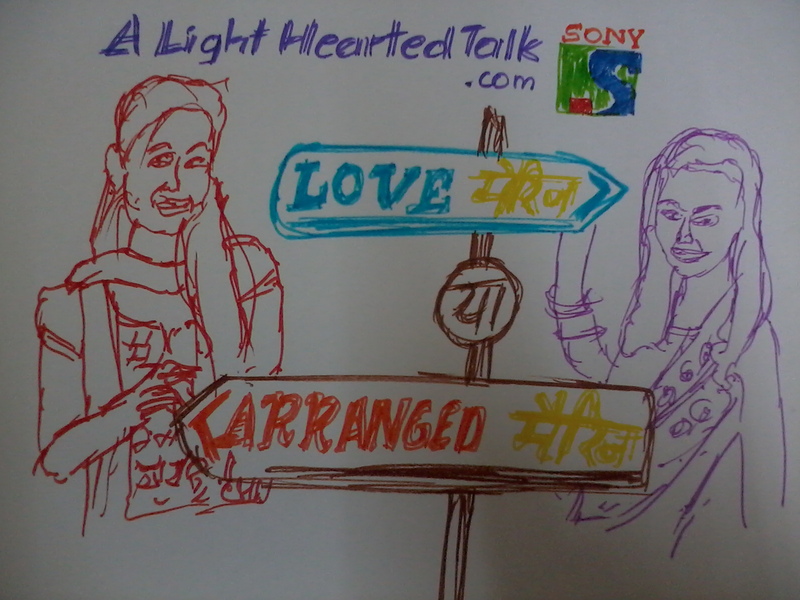 This is an entry for the contest 'Love Marriage ya Arranged Marriage!' on IndiBlogger. If you have liked this entry, do vote for it here. Also check out the facebook page of the serial 'Love Marriage ya Arranged Marraige' here. Nice one Ranjith, for every post you write i the like the way you add a unique sketch.. ..
Got lost a bit - but nice take. Nice post. Got seriously lost and checked multiple times who speaks what. But it was good. A wholesome take on stuff rather than a pre-guided point of view. Happy ending with a message. The impact of messages are better when written in story form. You are quite a story teller! Would be nice to put in a little more clarity on who says what - makes it easier to follow a story that way! But nice take - maybe a little too melancholy, but gripping too! Very well written story on a much debated topic.